The Special Olympics USA Games got their start in 2006 in in Ames, Iowa, when more than 4,000 athletes converged on the Iowa State University campus for the first multi-sport national Games in USA history. The fourth edition of the USA USA Games will be held July 1-6, 2018, in beautiful Seattle, Washington. The 2018 Games will bring together more than 4,000 athletes to compete in 16 traditional and Unified sports. Team Kentucky will send 45 athletes and 18 coaches to the 2018 Games, competing in eight sports – basketball, bocce, bowling, golf, flag football, gymnastics, swimming and track and field. In June 2014, 48 Kentucky athletes were among the 3,500 who traveled to New Jersey to compete in the third Special Olympics USA Games. 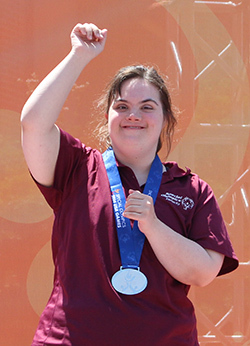 Kentucky athletes brought home 36 medals, including 18 Gold, as well as numerous other ribbons in track and field, swimming artistic gymnastics, bowling, bocce, golf, basketball and flag football. The medal haul was led by the three Kentucky gymnasts who claimed 15 medals, including 10 Gold on their own. Kentucky sent 42 athletes to the first Special Olympics USA Games in Iowa. Matt Minning of Taylor Mill became the first gold medalist in USA Games history when he received his medal for the 10,000 meters from Special Olympics, Inc. Chair Tim Shriver. In all, Kentucky athletes claimed 42 medals, including 19 Gold at those Games. Special Olympics Kentucky sent 43 athletes to the second USA Games, held , July 10-23, 2010, in Lincoln, Neb. Kentucky athletes represented the state well in bowling, basketball, golf, rhythmic gymnastics, softball, swimming and track and field, winning 34 medals. For more information about the Special Olympics USA Games or to find out how you can support Team Kentucky, please contact Special Olympics President and CEO Trish Mazzoni at 800-633-7403 or 502-695-8222 or via e-mail at tmazzoni@soky.org.